The Katak Chandi Temple is an ancient temple dedicated to the Goddess Chandi, the presiding deity of Cuttack,Odisha. The temple is located nearby the banks of the Mahanadi River. It is famous for the annual Durga Puja and Kali Puja festivals. The Durga Puja festivities are prominent in Maa Katak Chandi temple which takes place for 16 days stating from dark fortnight of Ashwina Krishna Ashtami till Ashwina shukla navami and Vijayadashami. 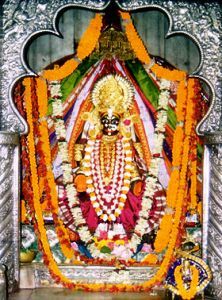 The goddess popularly called as Maa Katak Chandi, sits and rules on the heart of the ancient city.She has four hands holding Paasha(noose),Ankusha(goad),gestures dispelling fear(Abhaya),and granting boon(Varada). She is worshiped as Bhuvaneshvari (the queen of universe) by Sevayatas belonging to Utkala Brahmins everyday. Maa Chandi is worshipped in various incarnations of Durga during the puja. In Cuttack, people strongly believe Maa Cuttack Chandi as 'The Living Goddess'.